Researchers from Stanford University (California, USA) have developed a sensor that allows doctors to monitor the success of blood vessel surgery. The sensor (described in Nature Biomedical Engineering) measures the blood flow in an artery. The sensor is biodegradable, does not need a battery and operates wirelessly. Researchers from Stanford University (California, USA) have developed a sensor that allows doctors to monitor the success of blood vessel surgery. The sensor (described in Nature Biomedical Engineering) measures the blood flow in an artery. 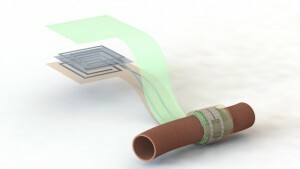 The sensor is biodegradable, does not need a battery and operates wirelessly – it is therefore compact, does not have to be removed and warns when the blood flow becomes blocked. The measurement of blood flow is essential for many medical interventions; a wireless biodegradable sensor can therefore be very beneficial for many medical specialities, for example in vascular, transplant, reconstructive and cardiac surgery. The sensor can improve the post-surgery care of the patient, without the need to repeatedly return to the hospital. Monitoring the success of surgery on blood vessels is important, because it is often too late when the first symptoms are noticed. In that case the patient has to return to surgery, with all the risks that are associated with that. The new sensor will enable doctors to keep an eye on the patient from a distance and intervene much earlier, should the need arise. The sensor is wrapped around the healing artery (see illustration); where the pulsing blood flow pushes against the inside. When the shape of the sensor changes, so too changes the capacitance of the sensor. Doctors can measure this change with a device that is in close proximity but outside the body. With this, the antenna of the sensor is ‘pinged’ – comparable to an RFID scanner. The sensor is in fact a wireless version of the technology that was developed to give prostheses a sense of touch.